While it is believed that compliance is fair to poor in many parts of the Chesapeake Bay basin, watershed organizations have lacked an independent means of verifying then correcting this – until now. A new model known as a Restoration Success Index has just been released by the Bird River Restoration Campaign. The chart above provides a graphic summary of the Index. The closer each factor gets to 100% compliance, the more likely it is that a waterway can be restored to our Child Safe & Friendly status. The chart also compares current compliance levels with those documented through past citizen surveys. Thus the Index makes it easy for waterfront property owners, other nearby residents, boaters, fisherfolk and other users to see if progress is being made in restoring their waterway to a healthy condition. Following the introduction below you’ll find a description of each Index variable. For most of the variables, clicking on the Index title will take you to further detail on how the variable was assessed. To download the Index factsheet click: Index. If you would like to attend a workshop to learn how to create a similar Index for your watershed then click the following: Register. Bird River is a tidal arm off of Gunpowder River located in Baltimore County, MD. The Bird River Restoration Campaign began just six months ago with the goal of making the tidal river and her 90 miles of tributary streams Child Safe & Friendly: free of health and safety threats, teeming with fish and wildlife, and accessible to the public via foot and boat. To achieve this goal the 200+ Bird River Volunteers have been learning about the many potential pollution sources which can impact these waters. The Volunteers have used this knowledge to assess how well sources throughout the 26-square mile watershed comply with Best Practices for minimizing negative effects. The chart above summarizes compliance. We think you’ll agree that in the brief six months the Campaign has been active,the Bird River Volunteers have accomplished a helluva lot. The following eight Index variables address existing sources of water quality impact in the Bird River watershed. These are distinguished from those associated with new development. Cropfields with Best Practices: Last November the Volunteers found that 80% of the cropfields in the watershed benefited from the following practices: cover crops, conservation tillage or grassed waterways. These practices greatly reduce nutrient and sediment pollution. Unfortunately the worst cropfields are located along the south side of the River. However, some of those farming these fields would like to make improvements if some obstacles can be resolved. Dumpsters with Best Practices: If lids are left open on the hundreds of dumpsters throughout the watershed then large quantities of trash could be carried by the wind to litter stream and river sides. Open dumpsters can also accumulate rain which when mixed with trash can form a polluting brew that escapes through rusted-out holes or when the dumpster is tipped into the collection truck. The Volunteers have found that only 66% of dumpsters have closed lids and complied with other best practices. We’re now working with watershed business organizations and others on a Dumpster Best Practices Pledge. We’re hoping this and other education efforts will quickly eliminate this source of litter and pollution. Forest Conservation Easements Intact: Since the early 1990s Maryland developers have been required to place 15% to 20% of each site into a Forest Conservation Easements (FCE). A comparison of eleven easements in the Bird River watershed with recent aerial photos shows that nearly 100% of the easement area remains intact, undisturbed. Stable Stream Banks: The Bird River Small Watershed Action Plan (SWAP) cited stream bank erosion as the leading source of sediment pollution. Since the early 1990s the County and State have spent upwards of $30 million on stream bank stabilization projects in the watershed. These projects may have eliminated much of the sediment derived from channel erosion. However, only about a fourth of all the 90 miles of channels in the watershed have been surveyed for erosion problems. So we don’t know what percentage of all eroding banks have been stabilized. The Volunteers may seek to gather this data through stream surveys. Aquatic Buffers Present: Based on a partial survey of the watershed, the SWAP identified 5.3 miles of Bird River tributaries lacking a 100-foot wooded buffer extending from both banks. The County-State restoration projects certainly have helped with this issue, but we cannot say how many miles of poorly buffered channel remain. The Volunteers may also seek to gather this data. Abandoned 207 Acres of Exposed Soil Stabilized: The Volunteers found 207 acres of exposed soil polluting the river system with large amounts of eroded soil. These exposed soils are located on inactive construction sites, former mines, landfills and unpaved parking lots. Last January we asked County and State officials to work with the property owners to stabilize these pollution sources. We believe that thus far only 8% have been stabilized. We’re awaiting recent aerial photos to determine the actual extent of stabilization. Stormwater BMPs Working: Since the 1980s more than 400 ponds and other stormwater Best Management Practices (BMPs) have been built throughout the Bird River watershed. They were designed to trap pollutants, maintain groundwater recharge, reduce channel erosion and flooding. The Volunteers have been visiting these BMPs and have found that 41% are no longer providing these benefits due to a variety of maintenance issues. We will be working with the County and BMP owners to gain the necessary repairs. Sewage Released: According to the Maryland Reported Sewer Overflow Database there have been at least 46 releases of nearly 400,000 gallons of sewage into the Bird River system since 2005. Three of the releases – totaling 64,000 gallons – occurred during the past year (April 2014 – April 2015). The Restoration Success Index goal is zero release. Exposed Construction Site Soil = Pollution: Why does exposed soil on a construction site equal pollution? Because the scientific literature shows that you need to reduce offsite soil loss by 90% to protect sensitive aquatic communities. The black silt fence and ponds you see on the perimeter of many sites only keep a third to half of the eroded soil onsite. This is why the laws adopted by the six Chesapeake watershed states and the District of Clumbia require covering exposed soil with mulch then grass (stone for road and parking lot beds) once earth-moving ends on any part of a construction site. These erosion control measures reduce sediment pollution by 90% to 99%. So if you see exposed soil on a construction site then pollution may occur come the next major storm. If earth-mving has ended, as indicated by the start of building or road construction, then the exposed soil is also a likely violation of local or state law. In June 2014 the Greater Baltimore Survey documented a 5% erosion control compliance rate in the Bird River watershed. This finding led to an increase in support for the County to improve enforcement which resulted in a doubling of enforcement staff. In November 2014, 58 Bird River Volunteers surveyed 26 construction sites and found a nine-fold increase in compliance! This summer the Greater Baltimore Survey will be repeated. We hope to find a further increase in compliance in our watershed. If you’d like to participate go to: Survey Registration. Use of Highly-Effective Stormwater Pollution BMPs: All Chesapeake Bay watershed states and the District of Columbia have modified their stormwater management criteria to require the use of highly-effective runoff pollution control BMPs. In Maryland and the Bird River watershed, most new development has been required to use Environmental Site Design (ESD) since 2009. With ESD we can gain the benefits of well-managed growth with essentially no aquatic resource impacts. 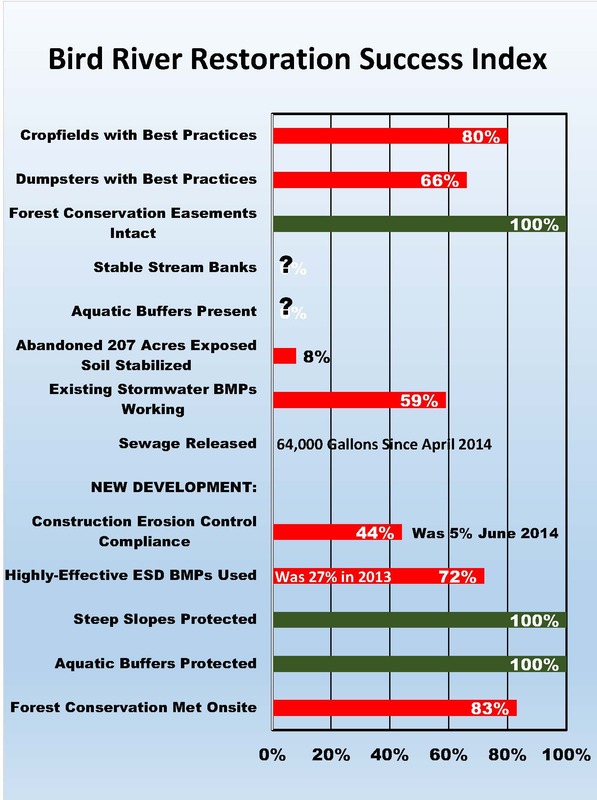 ESD consists of the use of highly-effective BMPs to control runoff along with aquatic buffers, preventing disturbance of steep slopes, maximizing forest retention, etc. Unfortunately, of the 492 ESD waivers granted statewide, 307 were issued by Baltimore County. This means many development projects were exempted from ESD compliance. However, a limited review of recent development plans shows an 72% ESD compliance rate. A Baltimore Countywide survey in 2013 showed a 27% compliance rate. So things may be improving. We are looking for more Volunteers to monitor new development for ESD compliance. Steep Slopes Protected: While volunteers review plans for ESD compliance, they also look for proposed disturbances to steep slopes and aquatic buffers. A limited review of development plans showed that 100% of steep slopes were protected from impacts due to new houses, roads or other disturbances. In Baltimore County a steep slope is defined as one that rises or falls more than 25 feet vertically for every hundred feet of horizontal distance. Aquatic Buffers Protected: The limited review of development plans showed that 100% of buffers to protect wetlands, streams and other aquatic resources were protected from impacts due to house, road or other forms of construction. Forest Conservation Met Onsite: Forest covers 29% of the Bird River watershed. To meet our Child Safe & Friendly criteria the forest cover must increase to a minimum of 45%. New development is the leading cause of tree loss. Developers are required to place a minimum of 15% to 20% of each site into a Forest Conservation Easements (FCE). The limited review of development plans showed that 75% of forest conservation requirements were met onsite, which is best. Developers paid a fee to meet the other 25% of their conservation requirements offsite. The fee is used to create or preserve forest somewhere else; not necessarily in the Bird River watershed. If we are to achieve the 45% goal then the County must ensure fee-in-lieu funds are spent to plant trees in our watershed or deny this option. Since 1970 I’ve been active in various efforts to recruit and mobilize volunteers for watershed restoration activities, including ten years as the director of Maryland Save Our Streams. I have never seen a response rate as high as that exhibited by Bird River watershed residents. The simplest publicity measures – yard signs and word of mouth – produce turn-outs of 50- to 75-people at each meeting. Consistently most meeting participants are new and half will sign-up for one or more of the pollution-reducing activities used to compile the Index. Last November, 58 volunteers participated in a two-hour training session then surveyed the 26-square mile watershed for four items: cropfield conservation practices, construction site erosion control, other areas of exposed soil, and stream channel erosion at road crossings. The report documenting the methods and findings showed 80% of cropfields with conservation measures, a nine-fold increase in construction site erosion control, 207 acres of exposed soil on 19 sites, and 50% of crossings exhibited signs of downstream channel erosion. To view the report from this effort click: Bird River Watershed Exposed Soil Survey. Subsequent one- to two-hour training sessions showed volunteers how to determine if stormwater ponds and other BMPs were still functioning or how to review project plans for compliance with Environmental Site Design requirements. We now have three committees for ESD Monitoring, Stormwater BMP evaluation, and Dumpster Owner-Renter Education. The chair of these committees: Amy Lamp, John Smith and Buzz Stromberger take care of training and monitoring on their own. But all three are now to the point where we have enough data so they are initiating actions to make sweeping improvements. These short-duration, action-oriented efforts work far better for a volunteer-based organization when compared to simply repeating the same activities year after year, like clean-ups. For three other issues we use road trips to train volunteers: Tracing Muddy Water & Other Pollution to a Source, Evaluating Dumpsters for Litter-Pollution Control Best Practices and Assessing Storm Drain Outfalls for Illegal Pollution Discharges. The Road Trips have proved quite popular and we now use them to introduce new volunteers to other, more complicated issues like construction site erosion control, ESD compliance and stormwater BMP assessment. After the Road Trips participants keep an eye out for problems as they travel about the watershed on errands or commuting. They slow down and take a quick look at stream crossing for pollution indicators. Or drive to the downslope edge of commercial-industrial areas checking out storm drains for suspicious discharges. We’ve taken the two County Council members who represent the watershed on tours so they can see the problems first hand. We’ve had low-level meetings with County staff regarding technical issues and are now meeting with agency directors to learn how we can support funding or policy initiatives to improve enforcement. All of this has been accomplished without staff; no one gets paid. Janet Terry serves as the hard-working president of the Bird River Restoration Campaign. Janet is supported by an informal Board. I serve as the volunteer technical advisor. The need for funds is very low and more than enough is provided by donations from those attending our meetings. All of our compliance monitoring efforts are a result of 40 years of refining the science and art of volunteer-based advocacy. All efforts are designed as short term campaigns. Typically we’ll evaluate a representative sample of potential pollution sources. If we find a significant problem then we report that to the responsible enforcement agency. If the agency works with us to seek improvements then we actively support their efforts by educating elected officials and the public so the necessary political and financial support is provided. If agency cooperation is not forthcoming then we use a variety of methods to publicize the problem which usually leads to an improvement. We’ll then allow six-months or a year to pass before carrying out another evaluation. This will then lead to another round of discussions about how compliance can be further enhanced; assuming it remains at less than 100%. All of our compliance monitoring efforts are also designed to accommodate folks who can donate two hours a month for a maximum of three months. We found early on that we were leading folks to believe they needed to commit for an extended period, which discouraged participation. Making the limited commitment clear has greatly increased the number of participants along with their enthusiasm. But designing actions to produce results is the true key to successful volunteer recruitment and retention. Few things in life are quite as satisfying as seeing that your efforts have helped solve a pollution problem. To learn how you can help folks in your watershed produce similar successes consider attending an watershed organizing workshop. To register click: Workshop Registeration.